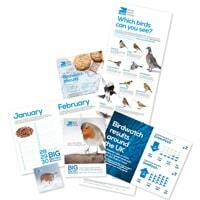 RSPB is giving away free Big Garden Birdwatch Pack on their website. The pack includes various tools, tips and info regarding birdwatch. You need to be a member of RSPB to receive this freebie and if you don't have an account already, just create one for free. Click on “GET IT HERE” button and then request your free bird watching kit pack now.